In 1917, President Woodrow Wilson signed Executive Order No. 2711 to establish the Cocopah Reservation. In 1985, President Ronald Reagan signed the Cocopah Land Acquisition Bill granting the Tribe an additional 4,200 acres. Presently, the reservation is comprised of three independent bodies of land (called the North, West and East Reservations) that encompass over 6,500 acres. 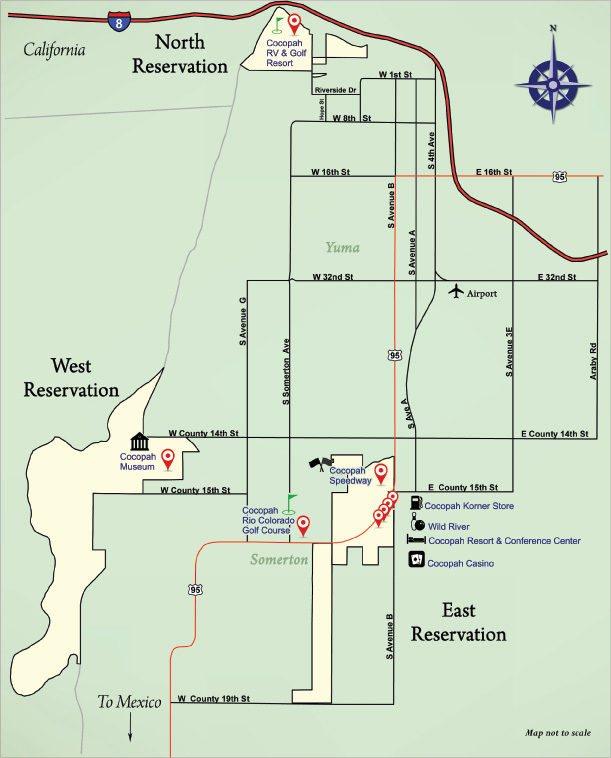 The Cocopah Reservation is located between Yuma, AZ, and the Mexican border along the Colorado River. There are approximately 1,000 Cocopah Tribal members currently residing on the three parts of the reservation. This Tribe was decreed part of its water entitlement in Arizona v. California, specifically in the Arizona v. California Consolidated Decree of 2006. The Tribe’s total diversion entitlement is 10,847 acre-feet annually (“afa”). Of this, 1,140 afa have a priority date of 1915 (1st priority within state of Arizona), 7,681 afa have a priority date of September 27, 1917, and 2,026 afa have a priority date of June 24, 1974 (this entitlement was added when the reservation was supplemented with additional acres). Although the Cocopah Reservation borders the Colorado River delta, the Reservation itself is entirely within the Yuma Basin. However, in Arizona v. California, “the Supreme Court awarded water to the Cocopah Tribe from the Colorado River system even though their reservation did not physically touch the system, because the Tribe was found to have relied on that source of water in the past.” The Tribe’s Bureau of Reclamation delivery contracts are codified as U.S. PPR No. 8 (for 1,140 afa) and PPR No. 1 (with a priority date of September 27, 1917). Paul Soto, Cocopah Director of Planning, makes it clear that the Tribe’s primary objective is supporting agriculture on the reservation. “We’ve always looked for water for irrigation . . . our only concern is irrigation. That’s just the way that it is.” The Tribe first ventured into farming after Arizona v. California was decided. The Tribe initially attempted to run the farm without outside assistance. “Then they tried to hire a manager. Then they tried to hire a better manager.” In the end, the Tribe decided that they had insufficient experience to run the farm and leased the land to non-Indian farmers. The Tribe included the water necessary to farm the land with these leases. Since these original leases were sold, the cost of water has never been assessed separately from the land. Initially this arrangement appeared to be fairly functional; for many years the Tribe was only using a third of its entitlement annually for irrigation. However, 2011 accounting showed that the Tribe had exceeded its annual entitlement. Soto attributed this to the inexperience of some of the farmers who now are leasing tribal lands. Nonetheless, the Tribe has agreed to share the cost of the overdraft with the farmers. The Tribe leases 2,400 acres of land for irrigation to these non-tribal farmers. An annual lease is estimated to cost around $600 per acre, including the water for production. The Tribe currently is using nearly its entire water entitlement of 10,847 afa. Because most of this water is used for irrigation, developing water resources for other uses is somewhat restricted by current uses. Aside from farming, the Tribe generates revenue from several other enterprises. The Tribe operates a golf course and resort and recently converted its bingo hall to a full-fledged casino. Right now, that casino receives water from the City of Yuma. When the expansion was occurring, the Tribe was negotiating with the City of Yuma to have the city deliver a portion of the Tribe’ s Colorado River allocation to the casino. The proposed arrangement with the City of Yuma would not have cost the Tribe anything except for the delivery cost of the water. However, ultimately the tribal council decided to rely upon groundwater because of the problems associated with delivery of the water. The casino is now entirely reliant on pumping groundwater. This is difficult on the casino’s water system because the groundwater is laden with metals and salts, which degrade the casino’s plumbing. Some Tribe members would like to explore other opportunities for using the Tribe’s water. However, the Tribe lacks the capacity to investigate all of the opportunities they are interested in. The Tribe does discuss conservation and efficiency with the farmers, but does not require any particular conservation measures when leasing tribal lands. The Tribe’s Cocopah Environmental Protection Office is responsible for monitoring well quality, the quantity of diversions, and overall groundwater levels on the West Reservation. “The riparian ecosystem along the Lower Colorado River has been greatly altered over the past century by water development projects, deforestation, agricultural development, and non-native species invasion.” All of these activities have helped cause a shift from native stands of cottonwood, willow, mesquite, and other species of trees to dense stands of invasive species such as salt cedar and common reed. Restoring the Colorado River has become a crucial objective for the Tribe. The Tribe has been engaging in activities to restore riparian habitat along the Limitrophe of the Lower Colorado River. The Tribe is seeking to restore the environment in a manner that renders it once again useful to Tribal members and wildlife. The Tribe attempted a restoration pilot project of 40 acres on the Cocopah West Reservation in 2008. This project attempted to remove invasive species and replace them with native species. These efforts proved difficult, as the environment had been altered because it no longer experiences the seasonal flooding that provided the required substrate for native species germination, flushed the soils of salts, cleaned out backwater wetlands, and recharged groundwater aquifers. Groundwater is of critical importance to the survival of riparian species. Because of the loss of this flooding process, the riparian zone has suffered from depressed water tables, minimal in-channel flows, and saline soils. The Tribe thought that if they began revitalizing the area, they could become the river’s stewards; that this could be a chance to bring back the birds and the vegetation. Not only would restoration fulfill the Tribe spiritually, but it could also serve the Tribe economically if the Tribe could develop parts of the river for recreation. However, there has been some concern over security because the river also serves as the border between the United States and Mexico. At one point, the tribe wanted to develop a recreational area with fishing and trails. However, Border Patrol objected because of safety concerns. Habitat Management Inc., Arizona Water Protection Fund, Cocopah Indian Tribe Colorado River Restoration Project Final Report 1, 1 (2011), http://www.azwpf.gov/Grant_Project_Reports/documents/08-156WPFFinalReport.pdf. Id. at 7 (“Native cottonwood and willow transplants must be planted in the capillary fringe or in the water table itself. While these species can tolerate moderate seasonal drawdown of the water table, they cannot tolerate prolonged drought.”). Id. (With this focus on restoration, the Tribe is not really interested in leasing water. It has used tribal water for other small developments, including a tribal RV park near the highway.). Position Paper of the Ten Indian Tribes with Water Rights in the Colorado River Basin. Submitted to the Seven States in the Colorado River Basin. 1992. Arizona v. California, 547 U.S. 150 (2006). Appendix C9: Tribal Water Demand Scenario Quantification 22 May 2012 (the Tribe is currently in litigation to claim 2,400 additional acres of irrigable lands, which would give the Tribe further water rights). Lower Colorado River Cultural Water Demand – Overview and Tribal Demand, Arizona Department of Water Resources (Feb. 10, 2013), http://www.azwater.gov/azdwr/StatewidePlanning/WaterAtlas/LowerColoradoRiver/PlanningAreaOverview/CulturalWaterDemand.htm [hereinafter Lower Colorado]. Chris Seldin, Interstate Marketing of Indian Water Rights: The Impact of the Commerce Clause, 87 Cal. L. Rev. 1545, 1548 n.16 (1999). Available at: http://scholarship.law.berkeley.edu/californialawreview/vol87/iss6/4. 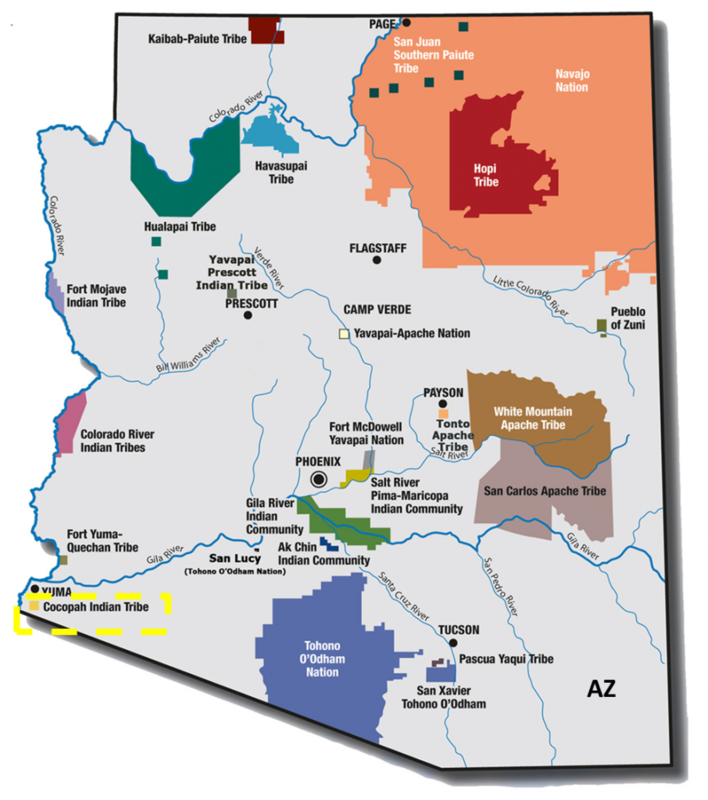 Bureau of Reclamation, U.S. Department of Interior, Listing of Individual Water Entitlements in the State of Arizona – Priority 1, http://www.usbr.gov/lc/region/g4000/contracts/entitlements/AZtable1.pdf. Interview with Paul Soto, at the Cocopah Reservation (Dec. 3, 2012). Lower Colorado, supra note 6.